Team Island Spirit is based in Hope Town Abaco and we are asking ourselves, “Why Move?” We go to the beach every day, walk the beautiful island trails and roads, swim in the pool and chat with boating friends. Visitors to this island pay $2,000 a week to to stay here, and we are on a mooring ball for $15 per day, $105 per week. So we are saying…..”Why move?” The Abacos are so pleasant in the spring time with the waters and skies so blue The temperature is 80 during the day and 73 at night. We are roughing it for sure. Here are some photos of our days here in Hope Town…..enjoy! Thank you for traveling along with us as we share our cruising destinations. Hope Town Abaco is certainly one of the highlights. The Island Packet Fleet of various yachts have sailed into Marsh Harbor in the Abacos and we have taken up home base off THE JIB ROOM which we LOVE. Marsh Harbor is a really good anchorage where the holding is fantastic and the large harbor has room for many many yachts. The Jib Room is located in the northeast end of the harbor. The public dinghy dock is on the south shore with easy access shopping. In town there are large hardware stores, pizza shops, bakeries, grocery stores and the famous BTC Bahamas phone store. We enjoyed taking over three large IP yellow/gold picnic tables on the porch which provided for a fun gathering where we all could visit, share sea stories and catch up on each others travels. Thank you to Tom and Linda, owners of The Jib Room, for creating and running what I feel is the best cruising stop in the Abacos. Wed night is Rib Night and Sat night is Steak night. On Monday nite, more IP’s gathered at The Jib Room to greet the new arrivals. 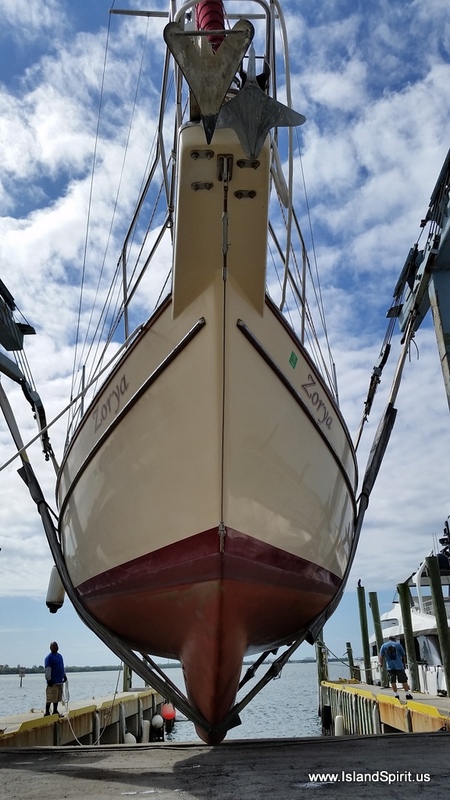 Boats attending either or both events were IP38 Holiday, IP440 Emerald Isle, IP37 Simple Life, IP440 Aventura, IP380 Blue Sky, IP38 Merry Sea, IP40 Tin Tean, IP420 Flatlander, IP37 Galileo and IP35 Island Spirit. Where is Marsh Harbor Abaco and the JIB ROOM? Desmond as low as you can go. He’s been performing for 26 years! Boats are moving again, some enjoying the Abacos and others starting to head west towards Florida and home. We wish you all fair winds and smooth seas, until we meet again! It is a simple 45 nm run from Great Sale Key to Green Turtle Key and in this case it was a total flat calm motor run as there are zero winds in the Bahamas this week due to a ridge north of here blocking all the winds. Fine with us, we prefer to sail but we also prefer calm passages, so I sanded teak and did a varnish job on passage. We arrived Green Turtle Cay on Wednesday and decided to stay here and enjoy the White Sound area on anchor. We took in the Green Turtle Club and enjoyed breakfast there. Good friends from Annapolis, Ken and Sara, biked over from Black Sound for dinner aboard. They recently organized the first ever St. Patrick’s Day Parade at GTC….we are sorry we missed it by just one day. Life is easy here. We did laundry. Sounds like not a big deal, but with 3 loads at $5.00/load to wash and $5.00/load to dry it adds up to a quick $30 dollars. While the laundry is running, we stay by the pool sipping coffee and looking out at our boat on anchor. So, the view and pool alone are worth the price! …. 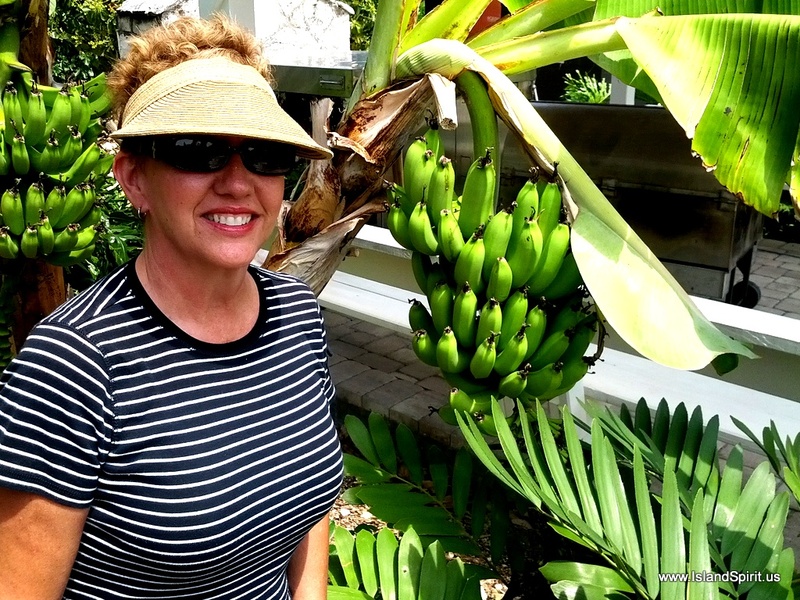 I really love to take photos in the Bahamas…. I rarely blog food, but this is worth it….get here and try one! Welcome to Green Turtle Cay where 400 people live. The settlement was founded in 1783 by black and white British Loyalists. They were colonists forced from the U.S.
following the Revolutionary War due to persecution and economic ruin. A home on the water, needs some work. Coral blocks for the foundation. Phone call, need to make a call? This phone works! On watch over the dinghy dock. Yes, life is slower, easier, and more peaceful in the Bahamas. Water is clear to 20+ feet. Fish are swimming under the boat and the sky is blue and the breeze about 5-10 knots right now. Temps are 80 degrees at noon and 70 degrees at night. You wake in the AM and hear NOTHING, only fish splashing, roosters crowing, and birds chirping. No car horns, no trains, no police sirens, no traffic, no TV news, nothing, just peace and calm and quiet…..ahhhh….welcome to the Bahamas! As we have said many times before, the hardest part of any cruising adventure is leaving, simply departing the safety of your home port or your current harbour. It is far easier to stay at one location rather than to make yourself move on. First of all, you are never fully ready as there is always one more item to find, more provisions to buy, and always something on the boat not working that needs to be fixed. After watching the forecast for days, an urgency factor comes into play when a weather window starts to open. On this preparation for our 4th trip to the Bahamas, it seemed as if this vortex was even stronger. Maybe this had something to do with the fact that we were based at Coconut Grove Sailing Club, Biscayne Bay, Miami, which is simply wonderful. It is also always hard to say good-bye to friends old and new, so we had one more IP Party on the Porch with IP380 Tamarak, IP38 Oceana, IP27 Time Goes By and IP380 Shawnee. Due to all this, we had a hard time leaving, but….we left and made West End, Bahamas, about a week and a half after our original planned departure. WOW are we glad we did! We had vivid memories of the beautiful dark blue waters of the Gulf Stream and that incredible aqua blue water coming up on soundings arriving West End Bahamas, but it now seems even better than we remembered. I have taken photos of the water off the stern, the beam, the bow, the horizon and nothing presents the true blue of this water. You must sail it and see it for yourself, it is so special and so beautiful. Checking in at West End was fast and convenient. Dockage at Old Bahama Bay is discounted 20% for members of the Royal Marsh Harbor Yacht club. We decided to stay two nights so we could enjoy the wonderful pool, Radeen loves to swim, so we stayed one entire day and walked the beach, rode bikes and swam in the pool. After the 91 mile, 13.5 hour passage, it was a very fun day! Here are some photos Miami to West End. After working up the mast for hours on the Radar, I broke the new belt and hit the bitters! Judith and Haakon’s gift from Scandinavia. Thank you….it is still working. Our Laptop screen with AIS on OpenCPN charting software. We are the red symbol, the line is our intended course and the green symbols are other vessels. Helm view at night, Radeen checking Passage Weather as we depart. We use red lights, which don’t ruin our night time vision. Motor sailing with full main full jib, doing 9 knots in the Gulf Stream. Let this review tour begin now as we return to our favorite places in the Abacos. We are excited to chase down our Island Packet Fleet that left a week before us. We plan to gather Saturday at the Jib Room for Steak Night, no better place! Thanks for sailing along. What a wonderful day, celebrating Radeen’s 60th birthday with Alan and Kathy of IP420 Flatlander! Alan’s birthday is also in March and we were happy to celebrate together again. We shared fond memories of Alan’s Spanish Cay birthday a few years ago. Radeen thoroughly enjoyed her Moet & Chandon Imperial champagne, parmesan shrimp over angel hair pasta and creme brulee. It was a day to remember! We have become too busy to blog! I used to blog every day or two. Now, I am running around touring the fantastic Miami area, taking in the sights, showing yachts, gathering with Island Packet Owners, renting cars, and provisioning the boat with the hopes of taking the NEXT weather window to the Bahamas. We have enjoyed several more IP mini-vous on the porch at Coconut Grove with IP380 Shawnee, IP380 Tamarak, IP38 Oceana, IP31 Pepromenon and IP27 Time Goes By. We also caught up with S&J yacht brokers, Michele and Jim for dinner and had breakfast in Tampa with our friend, Blaine, but have no photos to prove it! Our original IP flotilla (IP440 Emerald Isle, IP420 Flatlander and IP38 Holiday) sailed over while we supported our yacht listing, showing a beautiful IP35 to my Rock Hall broker friend Jim and his buyers. Driving to Tampa is 5 hours from Miami but we enjoyed the time spent showing the boat, reconnecting with Jim and meeting the potential buyers. We stayed at Craig’s condo and had a fun time visiting and catching up with him and Liana. This has been a very breezy winter with lots of east wind and very few opportunities to sail to the Bahamas. 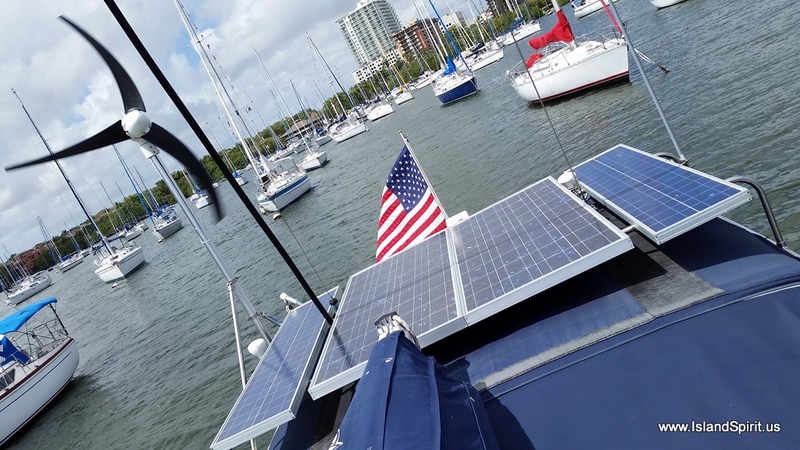 We planned to be here in Miami all of February with boat shows and our Denmark friends visiting to present seminars about their Arctic sailing, Now it is mid March and we are still here in Miami. Not a bad thing, as we do love it here, but we are looking for a weather window to move over to the Abacos. We plan to spend March, April and part of May in the Abacos. Now if we can only get the boat ready and a few items fixed and find the winds to allow us to cross, we will make the jump over. Here are some photos to catch up on over the past three weeks. Butterfly in the enclosure at Fairchild. This is the same butterfly as the next photo! This butterfly is nearly invisible on a wooden log with its wings closed. Wawa has made it to Florida, YAHOO, love their coffee! Bumped into Boat Buddies Bob and Nina at West Marine….AGAIN! This would be a motor sail….yet again! The hardest part of any trip is LEAVING the comfort and safety of port. Trying to figure out the winds and sea state for a gulf stream crossing is a real challenge. Play the Weather Router Game yourself, and look at this link. Use the GFS winds and look at the winds. Then look at the waves. When would you cross??? ?